That paved its way across the fields of green and yellow grain. The breeze turned toward a meadow where it strolled among the grass. 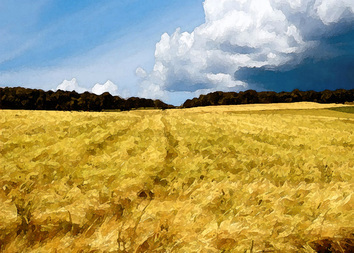 The oats and barley, wheat and rye, all swayed as it blew past. In sweeps and swirls of golden curls, they danced to summer’s song. With whispered hush the prairie waves rolled silently along. Amidst the fields of grass and grain, a farm pond glistened blue. Then bending down from where it stopped, it kissed the pond below. A ripple formed, quite small at first. The breeze began to blow. The ripple grew as it was pushed. The pond’s smooth surface, torn. And stronger still the breeze blew 'til... a little wave was born. The infant wave opened its eyes and tried to look around. “Kerplunk!” there was a splash nearby that made the wave’s heart pound. A big green frog had jumped into the water near the wave. A dragonfly called, “Hey, down there,” as it hummed overhead. “Perhaps you’d like to play some games?” a kind old turtle said. The tiny wave had so much fun each long, warm summer day. In games of tag or hide-and-seek, around the pond they’d play. Between these games the wave was taught about all nature’s laws. And learned how land and sea and air, have both their strengths and flaws. When one day something odd occurred which proved just what change does. A noisy truck drove down the lane and toward the pond did turn. A tank was strapped upon its back and nozzles stem to stern. It sprayed an awful smelling mist across the grassy plain. And from then on life on the pond was never quite the same. The frogs and turtles lay about and wouldn't play around. The dragonflies, more sadly though, were nowhere to be found. And so it paced the pond for weeks, not knowing what to do. To quacking sobs both loud and long, the kind a duck might weep. The drowsy wave shuffled around and searched the foggy pond. It found a noisy duck, but was unsure how to respond. 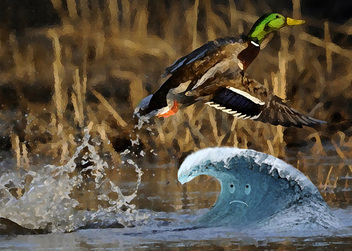 The mallard said, “Why, yes, in fact, that’s why I’m so depressed. Has left the frogs, and birds like me, with nothing much to eat. And chase away all nature’s friends that could have helped them, too. Our only hope,” the mallard said, “lies with their children now. It’s up to them to learn new ways and right these wrongs somehow. There is no need to spray so much, of this I have no doubt. “Perhaps I’ll help the children learn,” the small wave said aloud. Just then a flock of mallards flapped their way across the sky. “Well, no,” the small wave sadly sighed, and gave a sorry look. 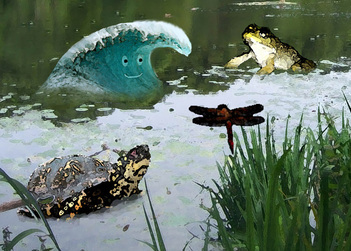 The little wave had never thought to leave the pond before. But with no reason now to stay, it might as well explore. “Will this brook lead me to the kids?” the small wave yelled right back. “You’re bound to come upon a few,” the duck called with a quack. And watched the mallards fly away, then headed for the brook. It trickled over rocks and stones that lay along its path. But with a little practicing, learned how to ride the flow. The small wave noticed that the land around the brook had changed. With moss and ferns all crowded in as thickly as they could. Like spotlights on the shrubs that grew upon the forest floor. When suddenly it found it faced a big, brown furry nose. The gruff voice asked, “You’ve never seen a grizzly bear before? I guess I can be frightening, but it’s not what you think. “Well, you must eat a lot of stuff,” the small wave did remark. The bear let out a hearty laugh, then took a bite of bark. The bear stomped off along the brook, the wave close at its heel. The wave could not help wond’ring what the grizzly might reveal. Loud buzzing sounds sliced through the air. The bear stopped in its tracks. Was falling toward them very fast. They both stared helplessly. The small wave screamed and dashed away to find a place to hide. The pine fell with a mighty CRAAAASH!Splashed water far and wide. The wave looked past the grizzly and beyond the fallen tree. The hills around were naked ground as far as it could see. “Perhaps their children,” groaned the bear, “will choose a different route. “And teach them to stop doing this.” It then began to rain. The grizzly turned and walked away as everything got wet. Again the silence was disturbed by distant buzzing sound. The little wave went swiftly on. The rain fell harder still. As muddy water flooded in, the brook began to fill. Without the trees to break its fall, the rain came down in droves. And washed away the soil from the newly clear-cut groves. The flooding brook swelled past its banks and tripped on stumps of trees. The rain stung on the small wave’s back just like a thousand bees. And still the rain kept falling, washing dirt into the brook. The water looked like chocolate milk, but full of leaves and gook. The wave was bounced and dragged along all night, or so it seemed. 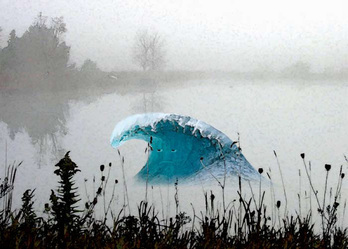 Next morning the wave found that it was floating in a stream. The little wave enjoyed the stream which was big, deep and wide. There was more room to swim around. Few bumps -- a smoother ride. The banks were high and steeper than those of the pond and brook. The little wave saw streets and yards, and stopped to take a look. Along the stream the banks were strewn with garbage, tires and tubs. A brown ooze poured out from a pipe. Into the stream it bled. It made the water dark and stale, and all the fish were dead. When a small nose and pair of eyes appeared up through the slime. Are washed down here and poison all the brooks and streams like these. Sometimes their sewage,” said the rat, “will gush out of that drain. “The children copy what they see,” the rat said with dismay. “Old habits are so hard to break. That’s what it’s all about. “I’ll try to teach the children, so that they can do their part. The rat then slipped beneath the slime and disappeared from view. In hope they played along the banks, and it might catch their eye. Where cars blew fumes into the air, spit oil on the ground. The journey had not gone too far when splashing could be heard. The little wave first saw two kids and then noticed a third. The three were laughing as they threw some trash into the stream. The little wave got so upset that it began to scream. “Oh please, you must stop doing that!” the wave yelled in alarm. “By tossing junk into this stream, you’re causing earthly harm. The children stopped and stood in awe at what they had just seen. 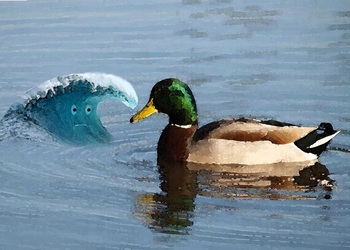 A wave that talked? How could this be? What did the small wave mean? By putting garbage in the stream it hurts the fish and birds? It poisons plants and taints the soil? These were disturbing words. What if this stream ran to a lake, where drinking water came? They might get sick, or even worse. And they’d know who’s to blame. The kids stopped throwing trash and junk and climbed back up the bank. They now had a new job to do and had the wave to thank. Not only would they not throw trash, they’d clean up what was there. No longer take for granted the fresh water, land and air. Recycling would also help to save the earth’s reserves. They’d give this planet the respect and honor it deserves. The little wave was thrilled to see the children dash away. It knew that they would not forget the lesson learned that day. About how balanced life on earth is something all should seek. The children will make changes once they know what it’s about. Yes, nature’s patient after all, and time need not run out.